Arthrogryposis multiplex congenita (AMC), or simply arthrogryposis, describes congenital joint contracture in two or more areas of the body. It derives its name from Greek, literally meaning "curving of joints" (arthron, "joint"; grȳpōsis, late Latin form of late Greek grūpōsis, "hooking"). Children born with one or more joint contractures have abnormal fibrosis of the muscle tissue causing muscle shortening, and therefore are unable to perform active extension and flexion in the affected joint or joints. AMC has been divided into three groups: amyoplasia, distal arthrogryposis, and syndromic. Amyoplasia is characterized by severe joint contractures and muscle weakness. Distal arthrogryposis mainly involves the hands and feet. Types of arthrogryposis with a primary neurological or muscle disease belong to the syndromic group. Often, every joint in a patient with arthrogryposis is affected; in 84% all limbs are involved, in 11% only the legs, and in 4% only the arms are involved. 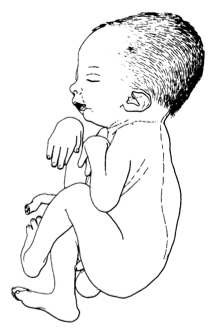 Every joint in the body, when affected, displays typical signs and symptoms: for example, the shoulder (internal rotation); wrist (volar and ulnar); hand (fingers in fixed flexion and thumb in palm); hip (flexed, abducted and externally rotated, frequently dislocated); elbow (extension and pronation) and foot (clubfoot). Range of motion can be different between joints because of the different deviations. Some types of arthrogryposis like amyoplasia have a symmetrical joint/limb involvement, with normal sensations. The contractures in the joints can result in delayed walking development in the first 5 years, but severity of contractures do not necessarily predict eventual walking ability or inability. Intelligence is normal to above normal in children with amyoplasia, but it is not known how many of these children have an above normal intelligence, and there is no literature available about the cause of this syndrome. There are a few syndromes like the Freeman-Sheldon and Gordon syndrome, which have craniofacial involvement. The amyoplasia form of arthrogryposis is sometimes accompanied with a midline facial hemangioma. Arthrogryposis is not a diagnosis but a clinical finding, so this disease is often accompanied with other syndromes or diseases. These other diagnoses could affect any organ in a patient. There are a few slightly more common diagnoses such as pulmonary hypoplasia, cryptorchidism, congenital heart defects, tracheoesophageal fistulas, inguinal hernias, cleft palate, and eye abnormalities. Research of arthrogryposis has shown that anything that inhibits normal joint movement before birth can result in joint contractures. Arthrogryposis could be caused by genetic and environmental factors. In principle: any factor that curtails fetal movement can result in congenital contractures. The exact causes of arthrogryposis are unknown yet. The malformations of arthrogryposis can be secondary to environmental factors such as: decreased intrauterine movement, oligohydramnios (low volume or abnormal distribution of intrauterine fluid), and defects in the fetal blood supply. Other causes could be: hyperthermia, limb immobilization and viral infections. Myasthenia gravis of the mother leads also in rare cases to arthrogryposis. The major cause in humans is fetal akinesia. However, this is disputed lately. Arthrogryposis could also be caused by intrinsic factors. This includes molecular, muscle- and connective tissue development disorders or neurological abnormalities. Research has shown that there are more than 35 specific genetic disorders associated with arthrogryposis. Most of those mutations are missense, which means the mutation results in a different amino acid. Other mutations that could cause arthrogryposis are: single gene defects (X-linked recessive, autosomal recessive and autosomal dominant), mitochondrial defects and chromosomal disorders (for example: trisomy 18). This is mostly seen in distal arthrogryposis. Mutations in at least five genes (TNN12, TNNT3, TPM2, MYH3 and MYH8) could cause distal arthrogryposis. There could be also connective tissue-, neurological of muscle development disorders. Loss of muscle mass with an imbalance of muscle power at the joint can lead to connective tissue abnormality. This leads to joint fixation and reduced fetal movement. Also muscle abnormalities could lead to a reduction of fetal movement. Those could be: dystrophy, myopathy and mitochondrial disorders. This is mostly the result of abnormal function of the dystrophin-glycoprotein-associated complex in the sarcolemma of skeletal muscles. 70-80% of the cases of the most severe forms of arthrogryposis are caused by neurological abnormalities, which can be either genetic or environmental. The underlying aetiology and pathogenesis of congenital contractures, particularly arthrogryposis and the mechanism of the mutations remains an active area of investigation, because identifying these factors could help to develop treatment and congenital finding of arthrogryposis. Research on prenatal diagnosis has shown that a diagnosis can be made prenatally in approximately 50% of fetuses presenting arthrogryposis. It could be found during routine ultrasound scanning showing a lack of mobility and abnormal position of the foetus. There are other options for visualization of details and structures using techniques such as 4D ultrasound. In clinic a child can be diagnosed with arthrogryposis with physical examination, confirmed by ultrasound, MRI, or muscle biopsy. Arthrogryposis multiplex due to muscular dystrophy. Arthrogryposis ectodermal dysplasia other anomalies, also known as Cote Adamopoulos Pantelakis syndrome, Trichooculodermovertebral syndrome, TODV syndrome and Alves syndrome. Arthrogryposis epileptic seizures migrational brain disorder. Arthrogryposis IUGR thoracic dystrophy, also known as Van Bervliet syndrome. Arthrogryposis like disorder, also known as Kuskokwim disease. Arthrogryposis-like hand anomaly and sensorineural deafness. Arthrogryposis multiplex congenita CNS calcification. Gordon Syndrome, also known as Distal Arthrogryposis, Type 2A. Arthrogryposis multiplex congenita, distal type 2B, also known as Freeman-Sheldon syndrome variant. Arthrogryposis multiplex congenita neurogenic type (AMCN). This particular type of AMC has been linked to the AMCN gene on locus 5q35. Arthrogryposis multiplex congenita pulmonary hypoplasia, also with a large number of synonyms. 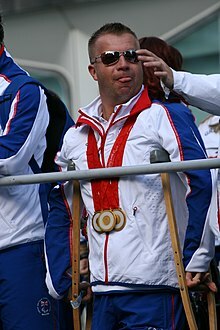 Arthrogryposis multiplex congenita whistling face, also known as Illum syndrome. Arthrogryposis multiplex congenita, distal type 1 (AMCD1). Arthrogryposis ophthalmoplegia retinopathy, also known as Oculomelic amyoplasia. Arthrogryposis renal dysfunction cholestasis syndrome, also known as ARC Syndrome. The treatment of arthrogryposis includes occupational therapy, physical therapy, splinting and surgery. The primary long-term goals of these treatments are increasing joint mobility, muscle strength and the development of adaptive use patterns that allow for walking and independence with activities of daily living. Since arthrogryposis includes many different types, the treatment varies between patients depending on the symptoms. Only a few good articles exist in which a surgical technique that is used to treat arthrogryposis is described. These surgeries are explained below. There are a number of passive devices for enhancing limb movement, intended to be worn to aid movement and encourage muscular development. For example, the Wilmington Robotic Exoskeleton is a potential assistive device built on a back brace, shadowing the upper arm and forearm. It can be difficult to fit and heavy and awkward to wear. Researchers at the University of Delaware are developing a light and unobtrusive therapeutic garment, suitable for babies and children, called the Playskin Lift. The garment looks like normal clothing but contains bundled steel wires under the arms, which help to push the arms toward a lifted position while allowing the wearer to move freely from that position. Children with the amyoplasia type of arthrogryposis usually have flexed and ulnarly deviated wrists. Dorsal carpal wedge osteotomy is indicated for wrists with excessive flexion contracture deformity when non-surgical interventions such as occupational therapy and splinting have failed to improve function. On the dorsal side, at the level of the midcarpus, a wedge osteotomy is made. Sufficient bone is resected to at least be able to put the wrist in a neutral position. 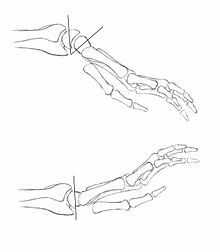 If the wrist is also ulnarly deviated, more bone can be taken from the radial side to correct this abnormality. This position is held into place with two cross K-wires. In addition, a tendon transfer of the extensor carpi ulnaris to the extensor carpi radialis brevis may be performed to correct ulnar deviation or wrist extension weakness, or both. This tendon transfer is only used if the extensor carpi ulnaris appears to be functional enough. The soft tissue envelope in congenital contractual conditions such as clasped or arthrogrypotic thumbs is often deficient in two planes, the thumb-index web and the flexor aspect of the thumb. There is often an appearance of increased skin at the base of the index finger that is part of the deformity. This tissue can be used to resurface the thumb-index web after a comprehensive release of all the tight structures to allow for a larger range of motion of the thumb. This technique is called the index rotation flap. The flap is taken from the radial side of the index finger. It is proximally based at the distal edge of the thumb-index web. The flap is made as wide as possible, but still small enough to close with the excessive skin on the palmar side of the index finger. The flap is rotated around the tightest part of the thumb to the metacarpophalangeal joint of the thumb, allowing for a larger range of motion. Many other surgeries are also able to improve function in joints of arthrogryposis patients. These surgeries usually exist out of tendon transfers and skin flap movements, adjusted to the individual. People with AMC look their worst at birth. AMC is considered non-progressive, so with proper medical treatment, things can improve. The joint contractures that are present will not get worse than they are at the time of birth. There is no way to completely resolve or cure AMC. But with proper treatment, most children make significant improvements in their range of motion and ability to move their limbs which enables them to do activities of daily life, and live relatively normal lives. Therapeutic interventions that are cornerstone in the treatment of AMC include: stretching and range of motion exercises, physical, occupational, and speech therapy, splinting and serial casting. Surgical intervention may also improve joint mobility and function. Other positive prognostic factors for independent walking were active hips and knees, hip flexion contractures of less than 20 degrees and knee flexion contractures less than 15 degrees without severe scoliosis. Arthrogryposis is a rare condition. Some authors say the overall prevalence is one in 3000 and others say it is one in 11000-12000 among European live births. Congenital clubfoot is the most common single contracture and its prevalence is one in 500 live births. ^ "The Free Dictionary: Arthrogryposis". Retrieved 11 July 2013. ^ a b c d e f g h i j Kalampokas, Emmanouil; Kalampokas, Theodoros; Sofoudis, Chrisostomos; Deligeoroglou, Efthymios; Botsis, Dimitrios (2012). "Diagnosing Arthrogryposis Multiplex Congenita: A Review". ISRN Obstetrics and Gynecology. 2012: 1. doi:10.5402/2012/264918. PMC 3461621. PMID 23050160. ^ a b c d e f g h i j k l Bamshad, Michael; Van Heest, AE; Pleasure, D (2009). "Arthrogryposis: A Review and Update". The Journal of Bone and Joint Surgery. American Volume. 91 (Suppl 4): 40–6. doi:10.2106/JBJS.I.00281. PMC 2698792. PMID 19571066. ^ a b c d e f g Bevan, Wesley P.; Hall, Judith G.; Bamshad, Micheal; Staheli, Lynn T.; Jaffe, Kenneth M.; Song, Kit (2007). "Arthrogryposis Multiplex Congenita (Amyoplasia)". Journal of Pediatric Orthopaedics. 27 (5): 594–600. doi:10.1097/BPO.0b013e318070cc76. PMID 17585274. ^ a b c d Fassier, Alice; Wicart, Philippe; Dubousset, Jean; Seringe, Raphaël (2009). "Arthrogryposis multiplex congenita. Long-term follow-up from birth until skeletal maturity". Journal of Children's Orthopaedics. 3 (5): 383–90. doi:10.1007/s11832-009-0187-4. PMC 2758174. PMID 19669823. ^ Brooks, James G; Coster, Douglas J (1994). "Arthrogryposis multiplex congenita: A report of two cases". Australian and New Zealand Journal of Ophthalmology. 22 (2): 127–32. doi:10.1111/j.1442-9071.1994.tb00780.x. PMID 7917267. ^ Wynne-Davies, R; Williams, PF; O'Connor, JC (1981). "The 1960s epidemic of arthrogryposis multiplex congenita: A survey from the United Kingdom, Australia and the United States of America". The Journal of Bone and Joint Surgery. British Volume. 63-B (1): 76–82. PMID 7204479. ^ a b c Rink, Britton D. (2011). "Arthrogryposis: A Review and Approach to Prenatal Diagnosis". Obstetrical & Gynecological Survey. 66 (6): 369–77. doi:10.1097/OGX.0b013e31822bf5bb. PMID 21851751. ^ Smit, L. M. E.; Earth, P. G. (2008). "Arthrogryposis Multiplex Congenita due to Congenital Myasthenia". Developmental Medicine & Child Neurology. 22 (3): 371–4. doi:10.1111/j.1469-8749.1980.tb03718.x. PMID 6446471. ^ Banker, Betty Q.; Victor, Maurice; Adams, Raymond D. (1957). "Arthrogryposis Multiplex Due to Congenital Muscular Dystrophy". Brain. 80 (3): 319–34. doi:10.1093/brain/80.3.319. PMID 13471804. ^ Stoll, C; Alembik, Y; Finck, S; Janser, B (1992). "Arthrogryposis, ectodermal dysplasia and other anomalies in two sisters". Genetic counseling. 3 (1): 35–9. PMID 1590979. ^ "ORPHANET - About rare diseases - About orphan drugs". Archived from the original on 2005-11-04. Retrieved 2007-04-25. ^ Kizilates, Sevim Ünal; Talim, Beril; Sel, Kutay; Köse, Gulsen; Caglar, Melda (2005). "Severe lethal spinal muscular atrophy variant with arthrogryposis". Pediatric Neurology. 32 (3): 201–4. doi:10.1016/j.pediatrneurol.2004.10.003. PMID 15730903. INIST:16634238. ^ Leichtman, Lawrence G.; Say, Burhan; Barber, Nancy (1980). "Primary pulmonary hypoplasia and arthrogryposis multiplex congenita". The Journal of Pediatrics. 96 (5): 950–1. doi:10.1016/S0022-3476(80)80591-9. PMID 7365612. ^ Illum, N.; Reske-Nielsen, Edith; Skovby, F.; Askjaer, S.; Bernsen, Alice (2008). "Lethal Autosomal Recessive Arthrogryposis Multiplex Congenita with Whistling Face and Calcifications of the Nervous System". Neuropediatrics. 19 (4): 186–92. doi:10.1055/s-2008-1052443. PMID 3205375. ^ Schrander-Stumpel, C T; Höweler, C J; Reekers, A D; De Smet, N M; Hall, J G; Fryns, J P (1993). "Arthrogryposis, ophthalmoplegia, and retinopathy: Confirmation of a new type of arthrogryposis". Journal of Medical Genetics. 30 (1): 78–80. doi:10.1136/jmg.30.1.78. PMC 1016242. PMID 8423615. ^ Rocco, M.; Callea, F.; Pollice, B.; Faraci, M.; Campiani, F.; Borrone, C. (1995). "Arthrogryposis, renal dysfunction and cholestasis syndrome: Report of five patients from three Italian families". European Journal of Pediatrics. 154 (10): 835–9. doi:10.1007/BF01959793. PMID 8529684. ^ Rahman, Tariq; Sample, Whitney; Jayakumar, Shanmuga; King, Marilyn Marnie; Wee, Jin Yong; Seliktar, Rahamim; Alexander, Michael; Scavina, Mena; Clark, Alisa (2006). "Passive exoskeletons for assisting limb movement". The Journal of Rehabilitation Research and Development. 43 (5): 583. doi:10.1682/JRRD.2005.04.0070. Retrieved 10 May 2017. ^ Jean-Francois, Edvige (April 2, 2014). "Robot exoskeleton lets girl lift her arms, reach for the stars". CNN. Retrieved 10 May 2017. ^ a b Chen, Eli (27 January 2016). "Building functional, fashionable exoskeletons for babies". NewsWorks The Pulse. Archived from the original on 4 August 2017. Retrieved 10 May 2017. ^ Maguire, Gillian (April 21, 2017). "Learning to Move with Move to Learn". Distillations Blog. Retrieved 22 March 2018. ^ "Researchers combat developmental delays with 'super suits'". Science Daily. May 17, 2016. Retrieved 10 May 2017. ^ Fishman, Margie (January 19, 2015). "Wearable tech: Supporting limbs, easing Parkinson's". Delaware Online. Retrieved 10 May 2017. ^ Van Heest, Ann E.; Rodriguez, Rudy (2013). "Dorsal Carpal Wedge Osteotomy in the Arthrogrypotic Wrist". The Journal of Hand Surgery. 38 (2): 265–70. doi:10.1016/j.jhsa.2012.10.034. PMID 23267756. ^ Ezaki, Marybeth; Oishi, Scott N. (2010). "Index Rotation Flap for Palmar Thumb Release in Arthrogryposis". Techniques in Hand & Upper Extremity Surgery. 14 (1): 38–40. doi:10.1097/BTH.0b013e3181d44583. PMID 20216051. ^ Hoff, Jana Midelfart; Loane, Maria; Gilhus, Nils Erik; Rasmussen, Svein; Daltveit, Anne Kjersti (2011). "Arthrogryposis multiplexa congenita: An epidemiologic study of nearly 9 million births in 24 EUROCAT registers". European Journal of Obstetrics & Gynecology and Reproductive Biology. 159 (2): 347–50. doi:10.1016/j.ejogrb.2011.09.027. PMID 22005589.